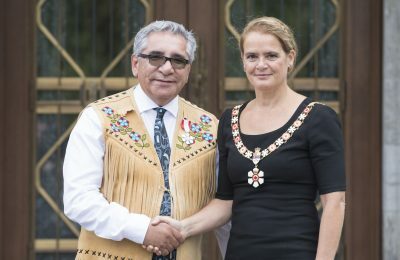 Nemaska, Eeyou Istchee (September 6, 2018) – Today, the Cree Nation Government is delighted and proud to announce the investiture into the Order of Canada of Grand Chief Dr. Abel Bosum. Sgt Johanie Maheu, Rideau Hall © OSGG, 2018. Dr. Bosum received this recognition as a result of his decades of service to the Cree people of Eeyou Istchee in northern Quebec. His achievements over many years of service include his leadership of his community of Ouje-Bougoumou from a forgotten people living in Third World conditions after repeated instances of forced relocation to accommodate the interests of mining companies. Under his leadership, Ouje-Bougoumou built an entirely new village which was recognized nationally and internationally for its innovativeness in community development. This was followed by years of exceptional diplomacy and negotiations as the Crees’ head negotiator for Quebec issues during which time he was able to fashion unique agreements resulting in win-win situations for the Crees, the non-Indigenous communities of the region, industry, and Quebec as a whole. He was elected to serve as Grand Chief one year ago. Dr. Bosum has joined the ranks of the truly remarkable Cree leaders who have been at the forefront of the struggle for the recognition of Indigenous rights and the translation of those rights into tangible benefits for the Cree First Nations in Quebec. In recognizing Dr. Bosum’s achievements, Canada is offered a glimpse of the enormous benefits to Canadians that come from the recognition of Indigenous rights and the hard work of negotiating arrangements that give expression to those rights.